Goodyear are a renowned tyre supplier, known for their high quality products that offer endurance and reliability with every purchase. Goodyear have been an innovator in the tyre industry for over 100 years, and are dedicated to making driving safer and more fuel efficient. 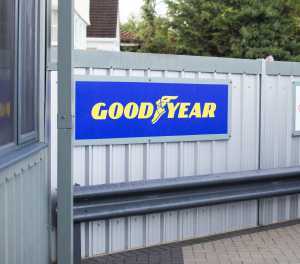 Tyresavers (UK) Ltd are a leading supplier of Goodyear tyres to Essex. Our team of highly trained technicians are knowledgeable on all aspects of the tyre industry, so will be able to provide you insight into the best tyre for your car. No matter your terrain or vehicle, with our expansive tyre selection, we’re guaranteed to have the perfect choice for you. As well as stocking and fitting a range of new and part-worn tyres, we also offer puncture repairs and wheel alignments, making us your one-stop shop for all of your tyre requirements. To make an enquiry on the range of Goodyear tyres we carry, get in contact with our team and we’ll be happy to help.